Originally, this was supposed to be a Halloween post about turning your jack-o-lantern into a Coins for Life box. Unfortunately, Super Storm Sandy had other plans. Now, it has become a project for Thanksgiving pumpkins. Coins For Life is a community service project in which individuals donate spare change to support bone marrow, stem cell, and cord blood transplant patients through The Bone Marrow Foundation’s Patient Aid Program. The Foundation helps bridge the financial gap and assists families with the costs of donor searches, compatibility testing, bone marrow or stem cell collection, cord blood banking, medications, medical equipment, home and child care services, housing, transportation, and other vital patient needs. 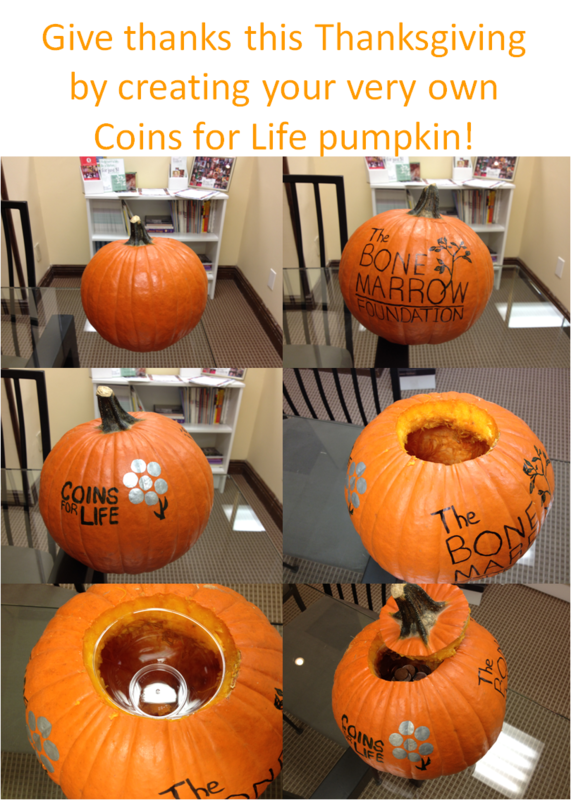 The Coins for Life collection boxes (or pumpkins) can be placed in offices, schools, grocery stores, shops or any place where there is money. Click here for more information about Coins for Life.